This Pennsylvania Dutch Classic Doesn’t Look Like Much, But It Tastes Awesome! Have YOU Tried Bacon Dressing?? We grew up with this recipe, so it’s not strange to us anymore, but we can understand if it seems a little weird when you first look at it or hear about it. Bacon dressing – made using bacon (and its drippings), sugar and vinegar – is a Pennsylvania Dutch classic that’s normally served over salad greens or potato salad, and it’s really, really tasty. Here, we decided to tweak the traditional serving method and, instead of grabbing a head of iceberg, we poured this dressing on top of some perfectly baked potatoes. The sweet and acidic qualities in the dressing went perfectly with the starchy potatoes and we were in heaven! If you’re game to try something new and delicious, give this dressing a shot…you’ll love it! 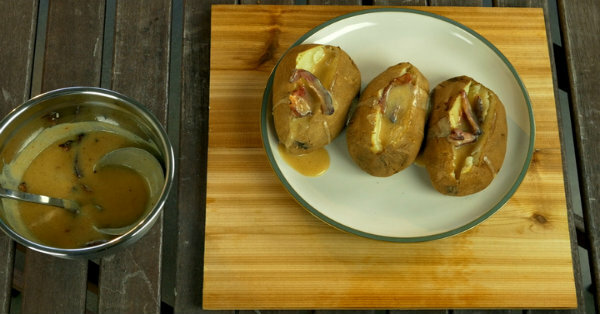 Preheat oven to 400º F and bake potatoes for 1 hour, or until fork tender. Cook bacon in a medium pan or skillet over medium-high heat until browned and crispy. Once crispy, reserve drippings and transfer bacon to a paper towel-lined plate to drain. In a small bowl, whisk together sugar and flour, then stir in mustard, egg, milk and vinegar and mix until smooth. Return drippings skillet to heat and pour in vinegar mixture. Crumble bacon into the dressing and cook over medium heat for 5-6 minutes, or until dressing has thickened. Remove from heat and serve hot over baked potatoes or salad greens.